Yes! These high quality vinyl pergolas, garden arbors, and trellis systems from New England Arbors provide total freedom from maintenance. They never need painting, staining, or sealing to keep their exceptional good looks. Unlike comparable wood products that age rapidly and require constant care, these backyard show pieces maintain a like new appearance. Vinyl Garden Arbours won't fade or yellow and have been field proven to maintain their color. They also will not crack, split, warp or peel like wood or corrode like metal arbors. 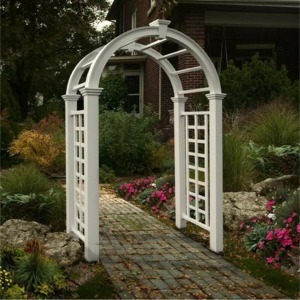 All products are backed by New England Arbors 20 year warranty. We offer a wide range of sizes and styles, made for any backyard or personal taste. Scroll through the options below or click here to see what accesories we can offer. Crafted from high grade vinyl, the New England Arbors vinyl pergolas are known for their beauty, durability and strength. 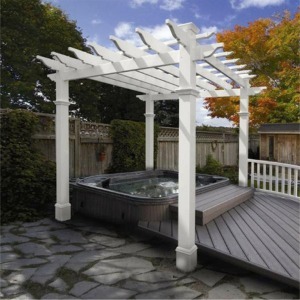 Each Pergola is a Do-it-Yourself kit that can be assembled by the homeowner and often just as one person. Important pieces are pre-drilled and all the pieces in the pergola kit are precut so no time consuming measuring and dangerous cutting is required. Our detailed instructions are available to you prior to purchase, making it easy to know exactly what you will need to do. Maintenance free and incredibly durable, vinyl arbors will provide years of enjoyment without the need for painting, staining, or sealing. Typically formed in an 'arch,' arbors make the perfect way to lead guests into any garden or to provide shade from the hot summer sun. It’s graceful curving segments - made in the New England style. 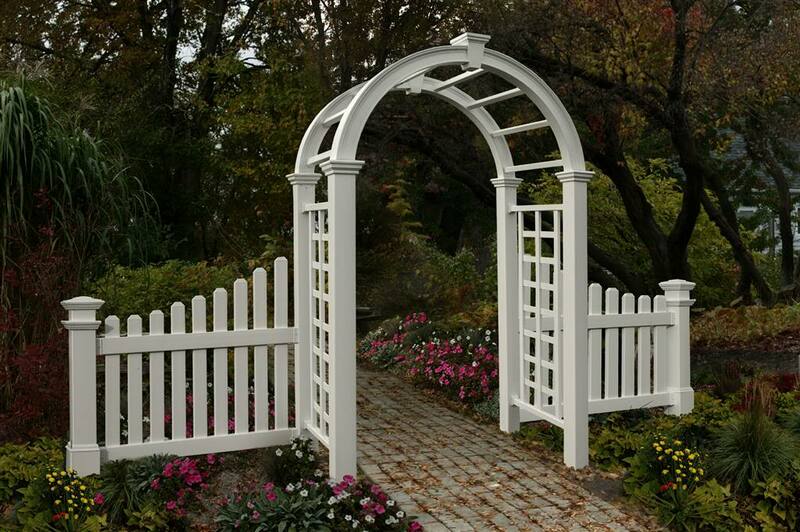 The New England Arbors Fairfield Grande is an example of a classic designed arbor and would be perfect for weaving with flowered vines. If you have limited space to grow plants, have you considered a planter box or a raised bed planter on your patio or porch? 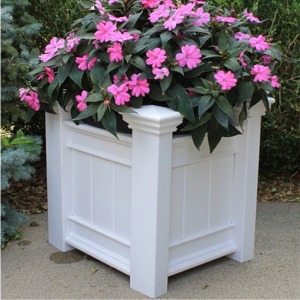 These simple and elegant planters from New England Arbors make it easy to grow a collection of flowers, herbs and veggies. Try thinking "inside the box". To get the most out of a limited area, such as a patio, deck or walkway; it might be helpful to draw up a quick sketch. This exercise can help define the length and width of planters you can use. Pay attention to the surroundings when placing raised bed planters. A north-south orientation yields the maximum sunlight. Whether decorative or functional, the imaginative use of a trellis can transform outdoor spaces. We have a good range of high quality, maintenance free vinyl trellises perfectly suited to contemporary or traditional applications. 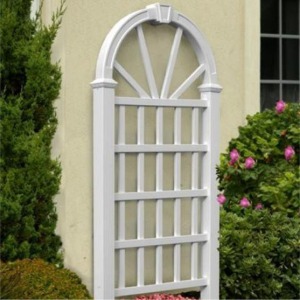 Where appearance and quality are important but the budget does not stretch to a custom made trellis our do it yourself kit provides a cost effective alternative, without compromising quality of construction, durability or finish. There is nothing like the welcoming beacon of the lamp post at the bottom of the driveway, signaling that you have arrived home. Additionally you can potentially keep criminals at bay when your yard is well lit up. 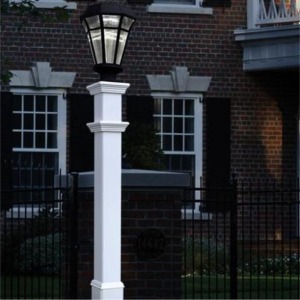 The beautiful lamp posts from New England Arbors add a touch of class to your yard and we have just the right selection for you to choose from. Lamp Posts are either solar, or hardwired. Each product is of high quality specially formulated vinyl. For peace of mind, our lamp posts come with a manufacturers warranty. We carry over 100 different combinations of gazebos, arbours and pergolas in sizes and colors designed to fit most decks and patios. If you don't see it here, call us, we will be pleased to advise and assist.